The trail to the spring began as a skid road over which native forest was hauled to bourgeoning lumber mills of the mid-1900’s. Together the path and I rise gently across an erosional terrace carved into the side of Upper Smith River Canyon during a time when the river and canyon were much younger. Twenty-five years ago I was much younger, too, and the way to the spring was cool and damp beneath a closed canopy of 50-year-old second growth Douglas-fir. Those trees were felled a decade ago. Today, the “third growth” Douglas-fir are only six feet tall, too short to impede warm spring sunshine buttering my neck. With luck, maybe I’ll live long enough to see them re-lace their limbs above the moist duff of a healthy forest floor. Beyond the clearcut rises the dim complexity of the old forest. This is the womb from which the spring is born, the source of a precarious do-it-yourself water system for the old house on the flat below. From a small depression on the side of the ridge, icy water burbles out of several sandstone pores. These trickle together into a tiny stream that has been interrupted by a four-foot concrete dam holding water in a small pool. The majority of the impounded water splashes happily over the dam and downward through a draw to the valley bottom. But a small amount exits the pool through a rusty pipe embedded near the top of the wall, then into a stiff black artery of plastic pipe. This pipe leads to the springhouse, a concrete box about six feet square and four feet deep, covered by a single-slope roof of green metal. When all is well upstream, the music of water trickles gently outward from cool darkness inside the box. An outflow pipe at the foot of the downhill-facing wall directs water to the house and garden about 900 feet downhill. 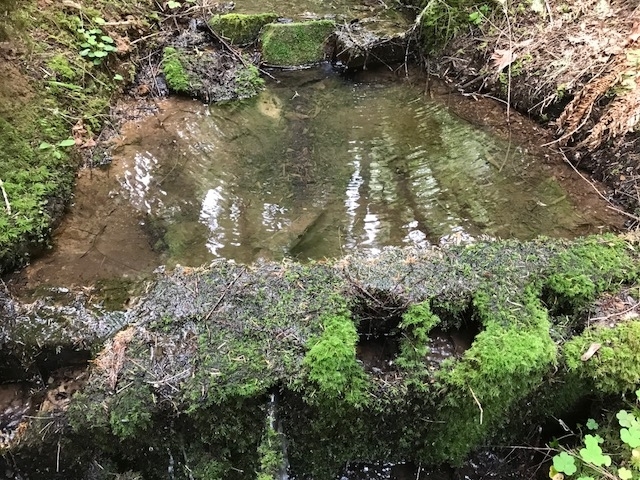 Unless water is being used, or the system has sprung a leak below the springhouse, the surplus flushes from a pipe near the top of one wall and vanishes with a hollow plunging sound into a hole shrouded by salmonberry and lady fern. A subterranean path unknown to those of us on the surface carries this overflow back to creek and onward to the valley floor, where it relaxes into a spreading wetland, home to rushes, sedges, and breeding chorus frogs. There are many things to love about this homegrown water system. It has enough vertical drop to be gravity fed, and it therefore requires little ongoing energy to run. Water comes directly from the earth, rather than flowing magically from a city faucet where it is the end product of complex infrastructure and maintenance. Over the years, my walks to the spring have become a seasonal tour of the natural and unnatural history of the Coast Range. These excursions have become encrusted onto my surfaces like slow-growing lichens, gathered the moisture of years, weathered the stone of my soul into soil that eventually became home to small plants rooted in my core. The logging was a dramatic change that I still resent. I miss the big second growth with its cooling summer shadow, extraordinary patch of fall chanterelles, winter rain dripping into deepening moss, spring trillium and Calypso orchids. Slowly I'm accepting the new clearcut as delayed gratification that precedes the squinting dampness of the towering old forest. This walk is also necessary because the delivery of cold water is often interrupted. Today I am not greeted by the normal dribble from within the gloomy basin of the springhouse. Nor is there water plunging from the overflow pipe. I also see that the outflow pipe at the foot of the springhouse wall has become disconnected. The pipe is easily reconnected at the junction, but this does not solve the problem of the absence of incoming water. At the intake pool, I find that winter deluges have filled it with flushed silt. A shovel leans against a large fir tree, left precisely for the purpose of dredging the pool. I begin scooping out heavy piles of drippy brown sludge. After reopening the pool, I walk to the origin of the spring 30 yards upstream for my customary drink from the white porcelain cup. This is a long cold communion drawn from a two-gallon pool of clarity disguising dissolved minerals that find their way from the bones of the mountains into my own bones. Along the path are delicate five-petaled oxalis flowers. Trilliums that once were white are now aging to purple. Twenty Calypso orchids that we transplanted just ahead of the imminent clearcut next door have dwindled to only two. Apparently we do not fully understand the needs of Calypso orchids. When I return to the newly dredged intake pool, the water has cleared. A southern torrent salamander larva the same size and color of my pinky squirts across the bottom. I love torrent salamanders. Like me, they require cold, softly flowing water. Unlike me, they are cute as buttons. The springhouse still isn’t receiving any flow. I discover a bolus of pebbles inside the pipe at the intake pool, and force them out with a foot-long stick. Finally, clear water gushes from the end of the pipe into the concrete collecting box. On my return trip to the house, I take the long way back through the old forest. At the edge of the dark trees is a self-propagating patch of sixty Calypso orchids blooming in profusion. Calypso orchids know exactly what they need. We need this forest water. Our partial taming of the spring feeds a mythology of self-sufficiency that runs deep and wide in my family. This isn’t surprising. I’m here because several generations of fiercely independent maternal and paternal ancestors eventually comingled in this valley back in the 1940s. But this proud independence has a cost. It fosters the idea that we are entities separate from the larger world. This is an illusion. Our home-grown water system exists only because myriad other people sucked petroleum from deep wells to synthesize plastic water pipe, dug and processed gravel into concrete for the small dam and springhouse, and developed the complex infrastructure that moved those manufactured materials to point of sale. Harnessing a tiny volume of water from the heart of these mountains has been the product of a complex network of cooperative extraction, manufacturing, and transportation. These human endeavors don’t include the natural processes that bring water murmuring from the side of this canyon. The ongoing life of the spring requires huge hydrologic phenomena of evaporation, cooling, condensation, and gargantuan atmospheric pinwheels driven to spin by changes in temperature and the rotation of Earth herself. Imagine 50 million years of geology, with all of the sedimentation, plate tectonics, uplift, and erosion that produced the exposed sandstone aquifer from which the spring now flows. Add to this a 200-year-old forest that shades the ridge and keeps the water cool in my throat and fit for torrent salamanders. We owe our water to a mindboggling confluence of earthly events. In the end, I treasure a measure of self-reliance and self-responsibility. Each of us should remain our own person. My ancestors built an old house in the Coast Range with clean gravity-fed water flowing from a spring in a forest that is home to wildflowers and torrent salamanders. But they didn’t do this alone. Nor do we live here alone. 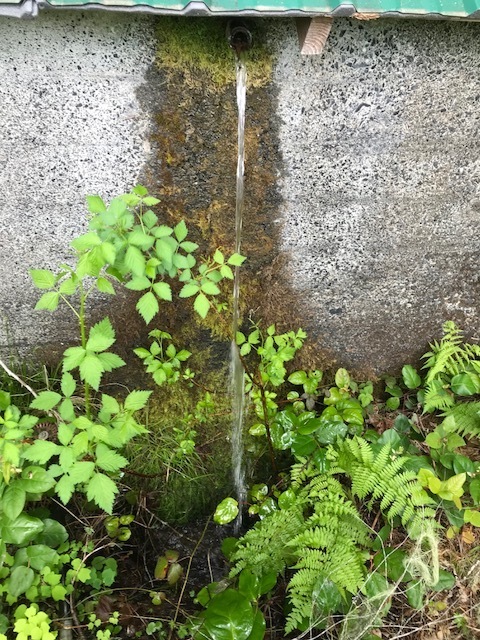 As I walk down the hill toward the house, with water surging through the pipe and sunlight drenching my shoulders, I’m grateful for all of this—the independence and interdependence that brings our water to life and our life to the water.